What Happens When Served a Domestic Violence Restraining Order? What Happens After Being Served With a California Domestic Violence Restraining Order? Under California law, you could be served with a restraining order for a multitude of reasons. A domestic violence restraining order is used when there has been alleged abuse from a spouse, former spouse or someone the plaintiff is dating or used to date. It can also be used when there has been alleged abuse against a close family member, cohabitant, co-parent or child. Abuse does not necessarily mean physical abuse. Though abuse does include acts or attempted acts of physical or sexual harm, verbal harassment and intimidation are also considered forms of abuse. Your right to contact. Generally, a restraining order protects the plaintiff from any contact with the defendant. This means you may not contact the plaintiff through text, phone call, e-mail, by mail or in person. In addition, you may not come near or contact anyone who lives with the plaintiff. Your right to see your children. In addition to restricting contact with the plaintiff, a restraining order could affect your ability to see your children. The court could grant child custody rights to the plaintiff. However, depending on the court order, you could be granted child visitation rights. Your right to live on your property. A restraining order could order you to leave your apartment or house if you are currently living with the plaintiff. It does not matter if the property is in your name. Your right to go where you please. In addition to staying away from the plaintiff’s home and workplace, you may also be required to stay away from your child’s school and homes of the plaintiff’s family members. Also, if you come across the plaintiff in public, you should leave the area or you could be arrested. Your right to possess or own a firearm. When a restraining order has been filed against you, you must turn in all of your firearms to local authorities or have them stored with a licensed firearm dealer. You must file proof of completion within 48 hours of receiving the court order. If you have been served a restraining order, you should contact an experienced, restraining order attorney before your court hearing. In California, a restraining order can last up to five years. If you fail to come to your court hearing, you forfeit your right to stand up for yourself. 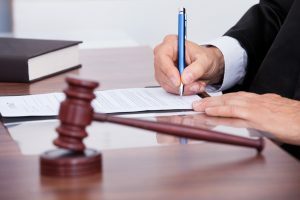 At the Law Office of Louis J. Goodman, we could help you file a legal response to the restraining order against you, defend your rights in court and fight for a fair outcome. If you have questions about your rights and responsibilities under California law, we could answer your questions. Contact our office at (510) 582-9090 or fill out our online form to schedule a free initial consultation. Comments Off on What Happens After Being Served With a California Domestic Violence Restraining Order?